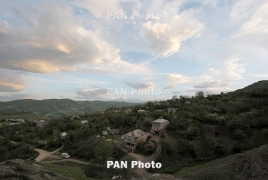 PanARMENIAN.Net - Azerbaijani Armed Forces shot up the Armenian villages of Baghanis and Vazashen, as well as the interstate road passing through the settlements on Tuesday, September 11. According to a Baghanis resident, journalist Anna Sahakyan, a bullet landed in the backyard of their house, Aravot.am reports. There are no reports of damage, more information will be available later in the day. Sahakyan said she was concerned that Azerbaijan is making a habit of shooting up the border villages during evening hours. According to Facebook user Hovik Gyozalyan, Vazshen also came under fire on Tuesday.